If you are trying to improve your health, but fail to address your sleep quality, then you are simply wasting your time. So many people underestimate the importance of high-quality restful sleep. Sleep is the equalizer. It affects absolutely EVERYTHING you do. The only problem is, many people struggle to fall asleep and miss out on its rejuvenating effects. Today, we will show you 3 simple ways to fall asleep quickly, so that you can get the restful sleep that you need. Welcome to the White Coat Trainer Sleep Series. In this series, we will discuss everything you need to know about sleep, why you need to care about it, and how to get restful sleep despite your busy schedule. How many hours of sleep do you get a night? What about on the weekends? Or when you take call? According to the CDC, approximately 2 in 3 adults do not get enough sleep on a daily basis. Having a busy schedule, and getting a long restful night is almost incongruent in today’s world. What’s worse is that many people will trade a good night sleep for just about anything. To watch the Walking Dead, or to read about everyone else’s problems on facebook etc. There is a reason why we spend close to a third of our lives asleep! Sleep always seems to take a back burner in today’s busy world. If you truly understood how important sleep was, you probably wouldn’t skip it as much. If you are trying to realize your fitness potential, then poor sleep quality can easily cancel out any fitness or nutritional improvements you might make. When it comes to fully optimize your health, everyone focuses on exercise and nutrition, and they forget to address the third component, sleep. There is clear and consistent data that individuals who do not sleep regularly are negatively impacting their health and fitness. Exercise is naturally an inflammatory, catabolic, destructive process that fatigues your musculoskeletal system and depletes your metabolic reserves. The only way that your body can adapt to exercise is to rebuild itself into a stronger, more resilient state. Sleep is the ultimate anabolic state. As such, it is necessary for reaping the benefits of the hard work you put in at the gym. If you choose to workout instead of sleep, you are making a bad trade. (I’m talking to you if you are training at 24-hour fitness at midnight). Sleep deprivation has also been linked to numerous illnesses and conditions, including mental effects such as irritability and poor decision making. You probably don’t need any studies to prove that last point to you. It can also lead to decreased libido and testosterone levels. Do I Get Enough Restful Sleep? Okay, so how do you determine if you get enough sleep? If you are a resident physician, you probably don’t. Everyone is different. The old adage of 8 hours of sleep each night does not necessarily pertain to everyone. There is also a difference between sleep quantity and sleep quality. Often times, quality is just as important at the quantity. Do you go through the day constantly yawning and feeling drowsy? Do you find yourself closing your eyes to “rest” in the middle of the day? Are you able to fall asleep within minutes of hitting the pillow? These are all signs that you likely have sleep deprivation. Don’t worry there is still hope. The only way to know how much sleep you really need is to do an experiment. 1) Identify a 5-7 day time period where you will have the best chance of maximizing your sleep. This could be during a vacation, or a few days off from work. Determine how many hours you want to obtain, and do everything you can to get it. Most people will need somewhere between 6-8 hours of sleep each night, so work backward from the time you need to wake up. It is also important to note that quality is just as important as quantity. 5 hours of good quality sleep may be just as restorative as 8 hours of broken, interrupted low quality sleep. Instead of focusing on a wake up alarm, set an alarm 30 minutes before you need to go to bed, and once it goes off you need to stop. Start wrapping up whatever you are doing and begin getting ready to go to sleep. You must resist hitting the snooze button. 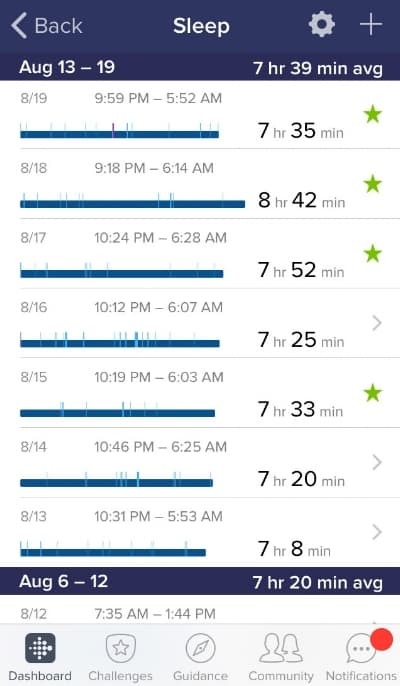 I use my Fitbit as a sleep tracking device. It predicts how many times I wake up throughout the night and how often I am restless. Do everything in your power to hit your target sleep goal. If you are able to successfully sleep the desired amount of time for 5-7 consecutive nights, take a moment to notice how you feel. Chances are, you will feel more refreshed. After running this experiment on myself, I noticed that I can get by with ~7 hours a night. Brittany can also get by with just 7 hours. 7 hours is all we need to wake up feeling rested, and get through the day energized. And this is with no coffee. If you are an average human being, sleeping less than 6 hours a night is probably too little, and sleeping more than 9 hours a night is probably too much. Now let’s move on to the top 3 ways to get restful sleep, despite your busy schedule. So without further ado, here are the top 3 ways to get better sleep. We have chosen these three because they are the ones that will give you the highest yield of falling asleep quickly. If you want to improve your sleep quality, understand that your body likes patterns and predictability. This is why tasks become easier as your practice them. Your body recognizes a pattern, and lays the neural groundwork to repeat that pattern. We can take advantage of this phenomenon to help us fall asleep. Do your best to go to sleep AND wake up at roughly the same time every single day. This includes weekends and holidays. If you are a resident physician, you may notice that when you rotate on a different service that requires you to wake up much earlier than you are used to, your body will begin to wake up naturally after a week or so, even before your alarm clock goes off. Obviously, this becomes difficult when you take 24-hour calls or take night shifts- but understand that you just need to be as consistent as possible. Get back into the pattern and the rhythm the next day. If you are working night shifts, ensure that you sleep the same 6-8 hours during the daytime. If you work a 24 hour call, then sleep 6-8 hours when you go home. If you are out at a social gathering or are having a late dinner with friends, excuse yourself before it gets too late. If it’s a weekend or a holiday, don’t stray too much from your normal bedtime. Who cares what everyone else thinks. It’s your body and your fatigue that you have to deal with. There is no need to be out at 1 or 2 am in the morning. As Ted Mosby from How I Met Your Mother would always say, nothing good ever happens after 2 am. On average, Brittany and I go to sleep every day at around 10 pm, and we are up around 6 am. You want to make your bedroom as much as a sleep haven as you can. This means using your bedroom for one of two things. Sleep and Intimacy. Do you perform work-related tasks on your bed? Are you talking on the phone while in bed? Do you watch a lot of television while in bed? All of these activities, which may or may not be related to stress, will create negative associations between yourself and your bed. Again, your body likes predictability. If you do a variety of different tasks on your bed, your body won’t know to associate the bed with relaxation and restoration. When it is time to go to sleep, your mind will begin thinking about all of the stressful situations you normally do on your bed, instead of what it should be focusing on. If you stop abusing your bed, your body will know that once you hit the pillow, its time to start shutting down. Do your best to not use your bed for anything other than what it is meant for. It might even be a good idea to get your TV out of your bedroom! As an OBGYN resident, one of the things that we see just as often screaming women in labor, are women with preeclampsia. This is a condition that develops in the second or third trimester of pregnancy where the body responds to the placenta by constricting its blood vessels. If left untreated, the patient can develop very high blood pressures, decreased perfusion to vital organs, and devastating complications such as strokes and seizures. Almost everyone knows someone who had preeclampsia. If you ask a former preeclamptic what they remember about it, they will tell you that they received a medication called Magnesium, and they hated it. It makes the patients feel warm, drowsy, blurry, and most of all sleepy. Every time we check on patients who are on Magnesium, they are often fast asleep. So what can we learn from this? Magnesium is a critical nutrient that can help us sleep. Some studies have found an association between Magnesium consumption and an increased ability to fall asleep faster. Magnesium also helps to regulate blood pressure, decreasing the risk of heart attack and strokes, and it helps regulate nerve function. This is why we give Magnesium to our preeclamptic patients. According to some data, many of you are not getting the recommended intake of Magnesium in your diet. No, a supplement won’t save you. The best way to get Magnesium is through your diet. Which foods are high in Magnesium? Check them out at 5 Common SuperFoods You Should Consume Every Day. So as you can see, sleep is much more important than you may think. If it weren’t a critical component to our health and fitness, we wouldn’t be designed to spend 1/3rd of our lives sleeping. Having a busy schedule should not be an excuse to skimp on improving your sleep quantity and quality. The only acceptable excuse is having young children. But understand that this is only temporary. Establish healthy sleep habits will help you get back on track. Try these 3 tips right now and see if your sleep improves over the next several days. 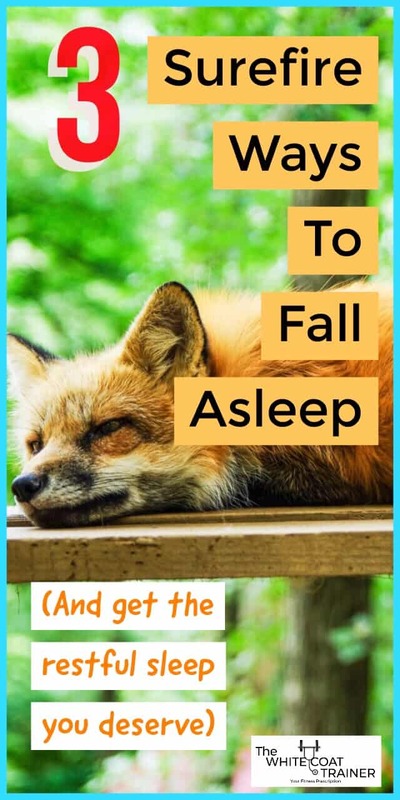 In the next post, 7 More Ways To Increase Deep Sleep [Even With A Busy Schedule], we go over a few more ways to help you fall asleep. Do you try and stick to a regular schedule on weekends and holidays? Know anyone who has had preeclampsia? It’s a horrible condition. Don’t forget to share this article if you found it useful, and subscribe to keep getting articles like this one! Wow this a fantastic post. 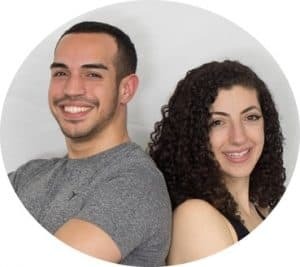 It is great to find a high quality fitness blog. I am always preaching about the benefits of sleep but people refuse to put their phones down and go to bed. I personally average about 7.5 hours per night. 8:30 to 4-4:30. I have actually seen amazing benefits of kind of super sleeping and getting 9+ hours. Not very practical now but in college I could hit the weights for two hours at a time almost everyday and feel great. I was also 20 so I’m sure that helped too. Love the content. Just subscribed and look forward to following along. Thank you for the kind words. Sleep is magnificent.I wonder how it would feel to sleep 9h on a consistent basis. Let us know if there is anything else you would like us to write about! If you are taking requests, I would love to hear your thoughts on how much volume per week is necessary for muscle/strength growth. Hey Grant, I will certainly make a series of posts on this exact topic. Stay tuned.